In comedy, timing is everything. The same can be said of elections - at least in the case of Joe Clark and his party. That's the analysis of Bill Neville, Clark's chief of staff, the day after Clark loses the 1980 election. The Tories have been reduced to 103 seats and watched Pierre Trudeau's Liberals sweep to a majority with 147. CBC Radio's Sunday Morning travels on the last flight of Clark's campaign plane to learn what went wrong. Neville says the Tories thought they would have more time in government and more time to plan for an election before being defeated. But ultimately, the party failed to sell its policies to the public. For now, Clark's leadership remains solid. Clark says he's committed to being prime minister again, and his candidates and cabinet respect how he ran the campaign. But, with a leadership review due soon, Clark is keen to get the official approval of the party. • The weekend before the 1980 election, a Gallup poll found that 48 per cent of decided voters favoured the Liberals, with the Progressive Conservative trailing at 28 per cent support. The poll was accurate within four percentage points 19 times out of 20. • The results of the election were: Liberals 147 seats, Progressive Conservatives 103, NDP 32. Social Credit was shut out. • According to Globe and Mail columnist Jeffrey Simpson, Clark struggled to keep the focus away from his image and on his policies during the campaign. "He complained about people focusing on his hand motions, his chin, his way of walking... His advisors thought his hardline speeches on foreign policy and his handling of the rescue of U.S. diplomats by the Canadian Embassy in Iran would also help dissipate the image of incompetence." • Before Clark's government fell, Pierre Trudeau had announced his intention to step down as Liberal leader. But with no new leader in place and an election looming, the Liberal caucus convinced Trudeau to change his mind. • Pierre Trudeau said the campaign wasn't about image, but about policies. "Canadians couldn't care less whether Mr. Clark looks like Robert Redford or whether I look like a shadow of a former gunslinger," he told supporters. "What they want to know is why Mr. Crosbie's budget, at a time of slow economic growth, says he's going to make it even slower by putting massive taxes on the Canadian people." • "We have conducted a national government and a national campaign of which we can be proud," Clark said in his concession speech on election night. "I naturally regret the results tonight, but that is what democracy is all about." • Clark drew Trudeau's "grudging admiration" that night. "He has shown immense dedication to his country," said Trudeau. "He has proved in this campaign that he is a man of great stamina." • A day after the election defeat, Clark vowed to occupy the prime minister's residence once again. He said he had told his young daughter Catherine the family was moving back to "the old house" (Stornoway) but that they'd be back in 24 Sussex soon. • Watch a TV news report about the 1980 election. 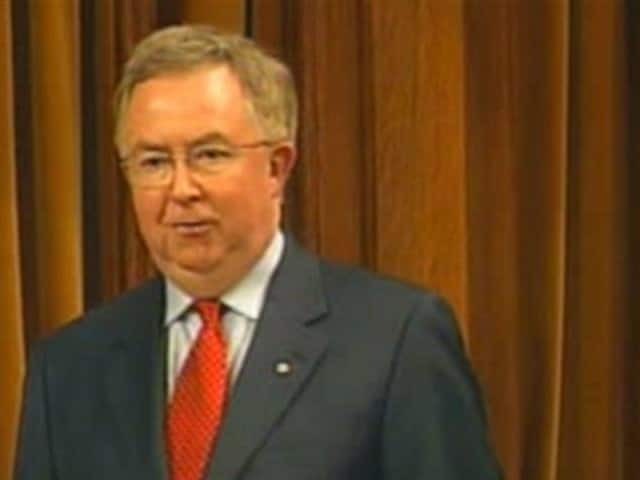 • At nine months, Joe Clark's term as Prime Minister was the fifth-shortest in Canadian history. • Sir Charles Tupper (two months and seven days), John Turner (two months and 18 days), Arthur Meighen (two months and 27 days in his second term) and Kim Campbell (four months) all held the job for a shorter period than Clark.